Handling, storing, and shipping of ammonia requires costly equipment and special precautions because of its inherent corrosiveness and toxicity. Scientists in Manchester, UK, have found that a metal–organic framework, MFM-300(Al), a porous solid, not only effectively filters harmful nitrogen dioxide gas, but it also has outstanding capabilities for ammonia storage. As detailed in the journal Angewandte Chemie, reversible uptake and release of ammonia proceeds by a unique sorption mode. Ammonia is an essential nitrogen source for plants and it is a basic chemical. This indispensable chemical, which is manufactured on a large scale from atmospheric nitrogen and hydrogen, has been called "bread from air". But how should this resource be stored and handled? The gaseous or liquefied form is corrosive and toxic. Storing and shipping under pressure or at low temperatures is costly and energy-consuming. Adsorption in porous solids, such as zeolites or metal–organic frameworks—a strategy currently being tested extensively in hydrogen storage—could be an interesting option. The robust metal–organic framework MFM-300(Al) has been shown to be a potent filter for nitrogen dioxide, which is a harmful pollutant in air. Martin Schröder and his colleagues at the University of Manchester, UK, have now scrutinized MFM-300(Al) for its ability to take up ammonia. They discovered that it could take up gaseous ammonia up to a density that comes close to that of liquid ammonia under ambient conditions. At around zero degrees Celsius it even surpassed this density. MFM-300(Al) consists of aluminum hydroxide moieties and biphenyl tetracarboxylic acid organic ligands that bridge the aluminum sites to form a rigid "wine-rack" framework, as the authors called it. Instead of wine bottles, gas molecules lie in the nanochannels and pores. As a base, ammonia binds to acidic centers. 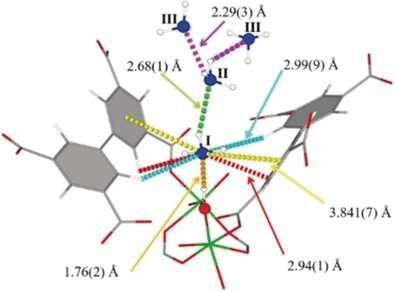 The authors identified three distinct binding modes based on electrostatic interactions. In total, four ammonia molecules associated with one aluminum center, and one square-shaped "wine-rack" void, could be filled with up to 16 gas molecules. The scientists determined the binding modes by neutron powder diffraction and refinement—a technique that can resolve the structural details with atomic resolution. The authors discovered that the packing of the ammonia molecules was almost as dense as in a liquid, and adsorption was reversible. Filling and releasing the pores up to 50 times was possible without any loss in capacity or deterioration of the framework, they said. And there is a unique sorption mode. Using labeling experiments in which the hydrogen in ammonia was replaced by deuterium, the scientists discovered rapid deuterium exchange with hydrogen from the pore walls. This suggests that the sorption mode could not be pure physisorption based solely on electrostatic interactions. However, chemisorption was not responsible either, because no adsorbent bonds had formed at the interface. "Significantly, the adsorption of deuterated ammonia in MFM-300(Al) revealed a new type of adsorption," the authors remarked. Rapid site exchange could be one of the reasons for effective ammonia uptake. This work shows that the metal–organic framework is suitable for ammonia storage and handling at densities close to those of the liquefied and pressurized gas. Ammonia, "bread from air", could indeed attain the consistency of bread.